Transformers are indispensable in the field of electronics. But the need for a bulky and expensive component like a transformer can be eliminated in circuits involving low current chips, by utilising the circuit presented here. In addition to being compact and versatile,this circuit is also low cost and capable of supplying almost any voltage ranging from 3 to 24 volts by selecting suitable component values.The Output is sufficiently regulated. Fig. 1 shows a single polarity DC power supply.it utilises R1 as a series dropper.D1 rectifies the voltage obtained through R2, while D2 stabilises the output to the specified voltage.C1 filters the output. 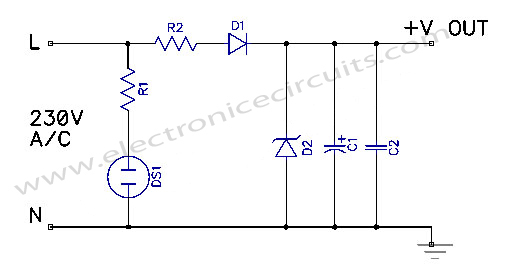 some ICs require a dual DC power supply.For this purpose, the circuit shown in Fig. 2 may be used.R1 drops the voltage . which in turn is rectified by D1. D2 stabilises the voltage and C2 filters it.The polarities of D1, D2 and C1 are reversed to obtain a negative voltage.Neon lamp indicates the presence of the mains. 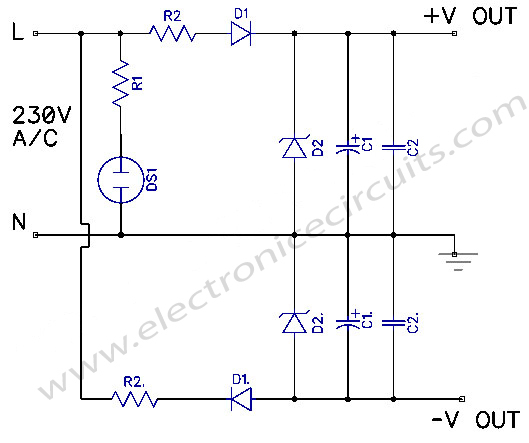 Both circuits are capable of providing 25mA current, They continue to provide the specified voltage even if the mains voltage varies from 195 to 270 volts. Suitable component selection table given here. The circuit can be used with low current ICs.The circuit has been successfully tested with with ICs like UM3482, UM3484, UM66, UM3561, UM3562, NE555, LM741, LM748 and LM556.the circuit is capable of providing around 25 mA current. The current supplying capability may be enhanced to about 40-50 mA by using a 5.6k, 2oW resistor as R2. However, this would require the use of at least a 1-watt zener diode. 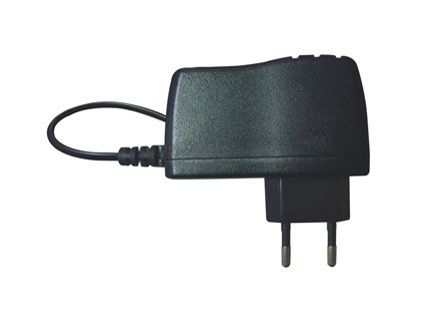 transformerless power supply is designed for currents up to 100mA! i want to run 12v DC light bulb into ac 230v AC power supply .. which circuit i had to made for it? can u send me circuit diagram…? send me the circuit for 230 a/c input and 12 dc output with 1 amps current rating please send me the circuit asap..thanks in advance …. Hi! Thanks for the circuit.. by the way,how can i have a resistance of 12k ohms 10W if i have 2 12k ohms 5w resistors? thanks in advance. do not do this, it can easily kill you if you make a mistake when connecting N and L.
can i put varistors, NTC Thermisthor, X and Y capacitors and inductors in input 230VAC for protection? yes! protection is very important! Hi. Can i do use circuit for the led driver? yes! transformerless power supply is intented for this use!!!! Can I have a circuit for 150-0-150 volt 25 amp for 2500 + 2500 w power amp? 24 0 AC to 24 0 24 DC 5amp supply convert. pls..help..